Sometimes I snap a totally random photo, and it winds up haunting and fascinating me for ages afterwards. 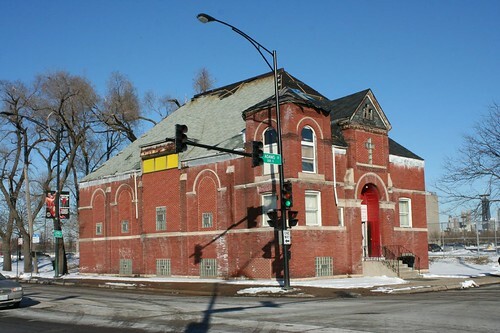 So it was with a shot of a near west side church I took in 2007, the New Holy Bethel Fire Baptized Holiness Church of God. I returned a few weeks ago to photograph it more intently. Only when I put the old and new photos side by side did I realize that the building has lost the roof and upper section of its turret. 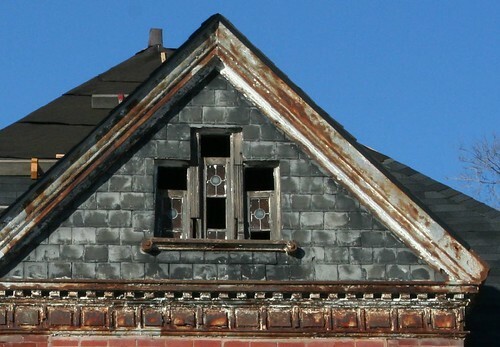 There’s been some reroofing work, but the roof – the whole exterior, in fact – is in pretty rough shape. 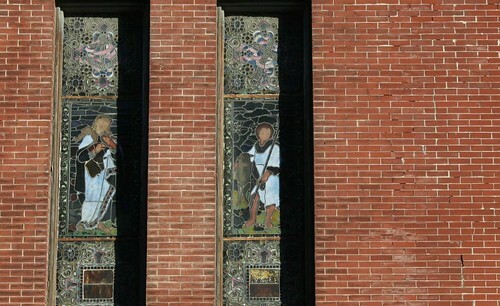 The windows were bricked in long ago, and nearly all the stained glass is gone. 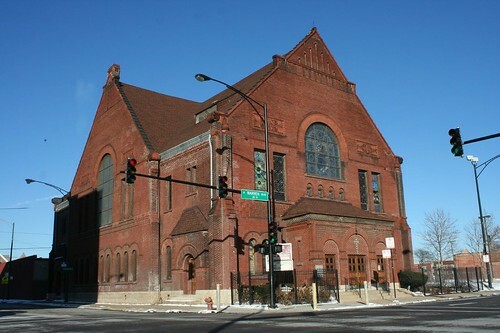 This modest Romanesque church stands at 1960 W. Adams at Damen, right by the United Center, though prior to Chicago’s 1909 street renumbering, its address was 739-741 Adams. The founding congregation was the Seventh Evangelical Church, later the Adams Street Society. 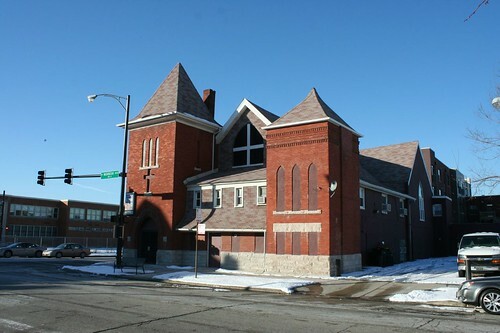 They erected a building which would commonly be referred to as the Adams Street Church, with a cornerstone date of 1888. 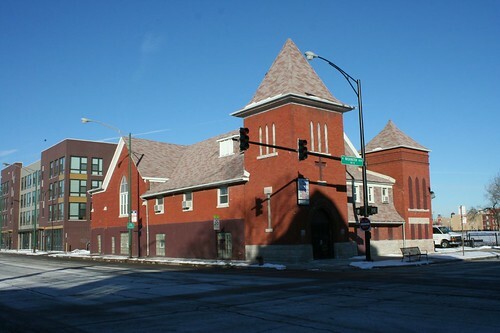 (Other articles refer to it as the “Evangelical Church at Adams Street and Robey”, Robey being the previous name of Damen until 1927, and the “Adams Street Church”. Most of these articles are the planned topics of Sunday sermons at various churches around town, while one describes the departure of one of its first ministers.) 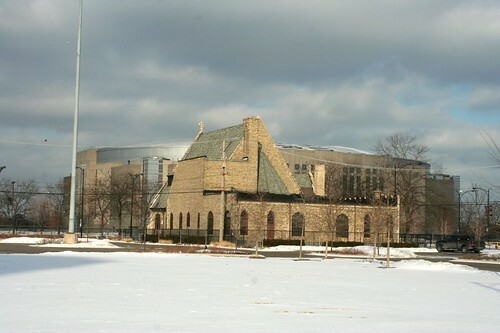 From its purchase in 1885, the church property was embroiled in a massive court fight between two factions of the Evangelical Church of North America. The congregation was also involved with the early Temperance movement. In 1928 it was sold to a Greek Evangelical congregation, the sales posting in the Tribune noting that “many prominent men” went to the church in the past. A 1953 newspaper ad notes that it was then a branch of the Church of God. 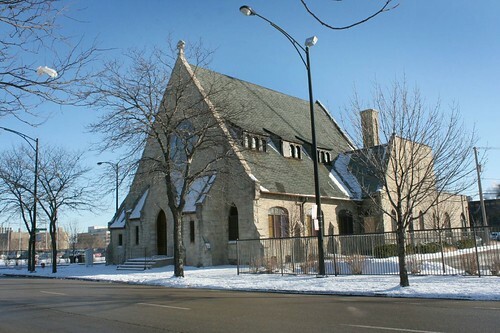 The cornerstone of St. Paul’s Reformed Episcopal Church was laid on February 22, 1886, and services were taking place in the new limestone building by May. Built at a cost of $38,000, it suffered a severe basement fire in December 1886, but quickly rebuilt. 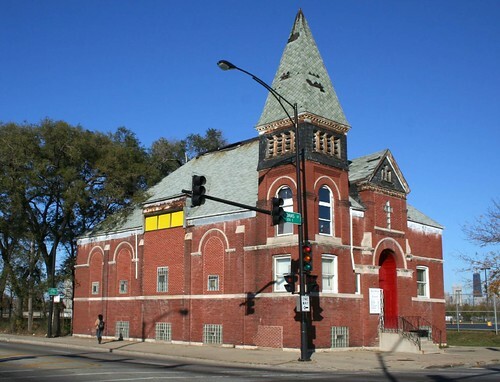 In 1950, police were twice called to the premises to break up scuffles that arose over the pastor’s attempt to sell the church to the West Community Church, a black congregation, and the previous congregants’ refusal to allow the new owners to take possession or enter the building. 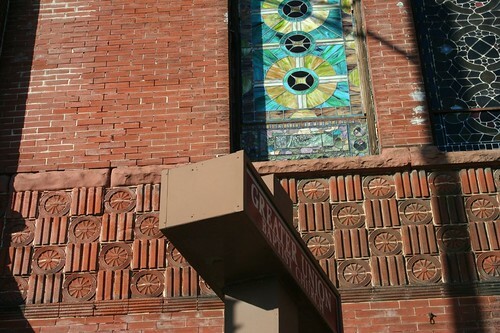 This fantastic church building wears some of its history proudly on its facade – a 1950s cornerstone relates that the GUBC was organized 1908, and purchased the building in 1928. Its original builders were the Church of the Redeemer. More on the church building’s history can be found on GUBC’s website. 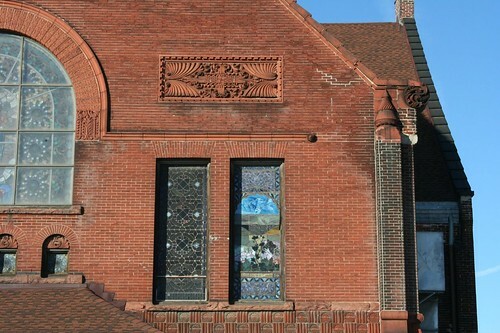 The exterior features superb terra cotta ornament and stained glass. This modest red brick church has a bizarre mansard roof that plunges down between the towers over the entrance. My guess is that there was a much more formal entrance originally, and that this was a way to shoehorn in some office space a long time ago. It was originally the Church of St. Andrew, dating back to at least 1886. The thing about these churches is, churches don’t just build themselves. For four churches to have gone up on this one little stretch of road, there must have been a sizable population in the area a hundred years ago. 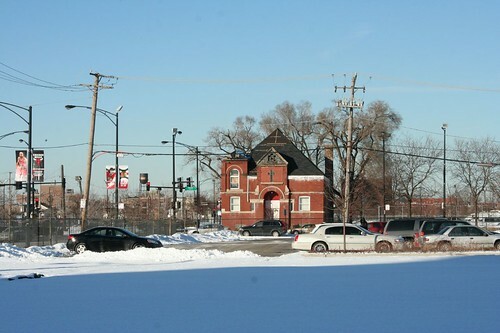 Today, there’s almost nothing – just vast fields of parking for the United Center. When planning for the stadium, originally meant to be a new home for the Chicago Bears, began in 1987, much of the area was already vacant land – 73%, according to the stadium architects, a figure that sounds about right based on some skimming of Historic Aerials.com. The area was devastated by the 1968 riots and never recovered. Stadium plans called for the demolition of over a hundred buildings. Banding together as the Interfaith Organizing Project, several churches in the area led the fight against the monolithic stadium, decrying it as a playground for the suburban rich, and protesting the thousands of elderly and empoverished neighbors that would be displaced. Plans for a new Bears stadium seem to have quietly died off… only to be revived as an enclosed arena for the Bulls and Blackhawks a few years later. The churches were only able to save themselves; their neighborhood was destroyed. The early newspaper announcement of the stadium plan makes mention of “pedestrian malls”, “urban” planning, physical connections to the neighborhood, trees and grassy knolls that would screen the parking lots, economic benefits to the residents of the area – all a hilarious fiction. Destroying the neighborhood was sold as somehow saving it. It’s an Orwellian twist of language that continues to be used today by powerful developers who want to get poor people out of their way. The result – major building survive, while the fine-grained context that gave rise to them, supported and nurtured them, are washed away. 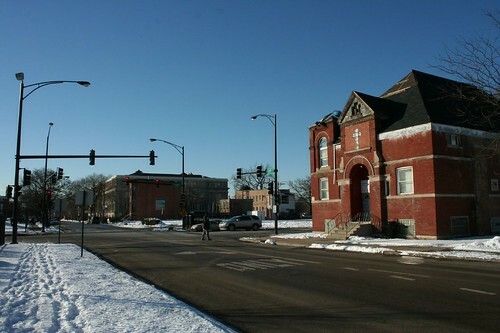 125 years after the West Side was developed, the surreal sight of an urban church in a parking lot is all that remains. What a fantastic post. I often drive down this stretch and always admired the churches, while simultaneously wondering how much longer they will exist. The near west side is a sad story indeed. Be it UIC, the Medical District, United Center, or the Kennedy and Stevenson Expressways…all contributed to obliterating what once was. And you can be sure it won't be the last time either. Thanks for the article and welcome back. I was getting worried there for a while that yet another of my favorite Chicago blogs was going to go "on hiatus." @Nick – thanks! Glad to be back. I definitely am planning a slower rate of posts this year – I want to do longer and more in-depth posts when possible. If you're really starving for more architecture stuff, go visit http://www.BuiltStLouis.net, which I've been updating with a vengeance since the new year started.